HandKrafted by Stephanie: Sparkle Creations September Release Day! Sparkle Creations September Release Day! Hello! Today is the day that the Sparkle Creations Rubber Stamps September images are available for purchase in the store! Today we are showing you the third and final image, Farming Oliver! 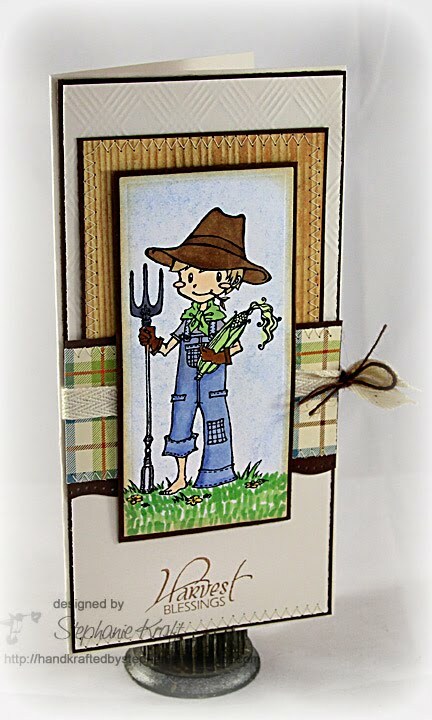 I paired this sweet little farmer image with some wood grain (Wanted by Cosmo Cricket) and plaid paper (Farm Fresh by October Afternoon). I colored him with Copic markers, added some grass, sponged the background sky and added some Antique Linen to the edges of my image panel. It is getting close to harvest time for my BIL and SIL, and despite the nearly non-stop rain they got hit with this summer, I am hoping that they have an abundant harvest this year! I thought the tall image would fit nicely on a long card (which I don't make that often). Since this had a masculine feel to it, I finished it off with some natural twill and brown twine. I used Mercy's sketch from last week for my layout (MTSC89). My sentiment reads Harvest Blessings (from Verve's Harvest Blessings). All 3 images that we have peeked this week are now available in the store! Be sure to visit the rest of the SCRS designers for more peeks of Farming Oliver. Sparkle will be giving away a Farming Oliver to one lucky person! For a chance to win, you need to comment on all of the designer's blogs (list below). Then head on over to the SCRS blog and comment on the Oliver post. You have until midnight EST each day to comment. The lucky winner will be announced the following day! Accessories: Long Rectangle Nestabilities (Spellbinders), Dotted Wave border punch (EK Success), Picnic Plaid impression plate (Papertrey Ink), Markers (Copic), Natural twill, Twine (May Arts), Foam tape, Thread, Sewing machine. I love the textures used on this card... The stitching, cord and ribbon. This is just darling! I love your grass! Beautiful! ALL your cards are just so adorable! I am loving seeing my illustrations being turned into stamps then turned into breautiful cards!!! I have really enjoyed your cards in this preview Stephanie - you are a pro at making the image the focus of the card. Another beautiful job. I'm in love with your card girl! Oliver looks fantastic and the different textures compliment each other perfectly! Beautiful card! Love all the texture you added to it! What a great card. Love the image, and also the way you colored the grass. This is absolutely stunning - love your distinctive CAS style & am learning a fair amount through your work. Love the plaid & the embossed white background & the woodgrain paper is so effective. Fun, Fun Fun! Love your design that frames out the sweet image!